Explore MoreVIDEO: Myth or reality? Get a closer look at the Lizard Man. , VIDEO: Ranked #4 and #7 in Top 10 Scariest Moments from Lost Tapes. , QUIZ: Are you anything like the Lizard Man? Find your Creature Personality. , ON TV: Check the Lost Tapes Episode Guide for air dates. LEAPING LIZARD MAN! The Lizard Man is a cryptozoological creature said to inhabit swampland in and around Lee County, South Carolina. Humanlike in form, the Lizard Man is said to have many reptilian or dinosaur-like qualities, including green, scaly skin and three-toed feet and hands. According to witnesses, each of its digits has a circular pad that allows it to cling to trees and walls, much like a gecko. Standing an intimidating 7 feet in height, Lizard Man is said to be extremely fast and incredibly powerful, capable of ripping open cars with its bare hands. Most firsthand accounts of this creature also describe its glowing red eyes. 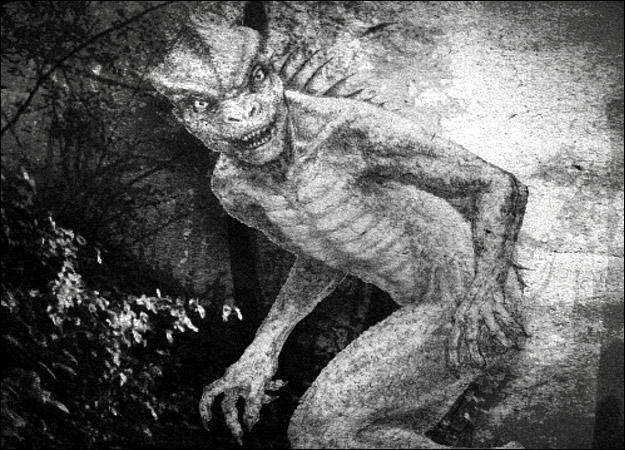 SIGHTINGS AT SCAPE ORE SWAMP: The Lizard Man of Scape Ore Swamp was first reported on June 29, 1988, by a 16-year-old named Christopher Davis, who claims he was chased by the creature after stopping to change a flat tire. Several reports followed during the summer of 1988, many of them mentioning unusual scratches or bite marks on cars parked near the swamp. The local sheriff's department chalked the sightings up to a lone bear, but were later puzzled when biologists were unable to classify a plaster cast of a 3-toed, 14-inch footprint taken from the area. ANCIENT REPTILIAN HUMANOIDS: While the "Lizard Man" is a relatively recent cryptozoological phenomenon in the Americas, tales of reptilian beings can be traced back several millennia in other areas of the world. Cecrops, the first mythological king of Athens -- the leading city of Ancient Greece -- was described as a serpent from the waist down. In the Far East, an ancient line of emperors claimed to be directly descended from dragons, and it was thought that they could change form at will. Indian legend tells of underground reptilian beings that once inhabited a continent in the Indian Ocean that sank beneath the waves.